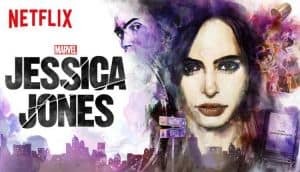 Jessica Jones Season 3 Greenlit | Nerd Much? Even though Disney has announced that a streaming platform of their own is headed our way, Netflix isn’t letting that bother them. The streaming giant has announced that they are bringing Marvel’s Jessica Jones back for a third season. The Krysten Ritter led Jessica Jones is regarded as the most critically acclaimed of the Netflix Marvel shows. Season 1 earned itself a Metascore of 81 following its 2015 debut. Season 2, while still solid, came in at lower critic average of 70. Jessica Jones followed Daredevil as the second Marvel Cinematic Universe Netflix series. The success of both shows paved the way for full season orders of Luke Cage and Iron Fist. With 2017’s The Defenders being the culmination of the four heroes coming together as a team. The Punisher also became a prominent figure in the Netflix portion of the MCU following the character’s successful introduction in Daredevil Season 2. His own series aired in 2017 as well. Melissa Rosenberg is the showrunner of both Season 1 and Season 2 of the show. Netflix hasn’t announced anyone specific being attached, but it’s likely Rosenberg will return to helm the show for Season 3. Jessica Jones’ second season just debuted (on International Woman’s Day) March 8th. Following her will be Luke Cage’s second season which is poised to premiere on June 22nd. A third season was also ordered for Daredevil back in October. Vincent D’Onofrio’s Wilson Fisk is expected to play a prominent role in the story once again. Season 2 of Iron Fist is currently filming. The series is now being handled by Raven Metzner who is taking over for Scott Buck. No release window for that has been announced yet. Season Two of The Punisher is currently filming as well. Netflix doesn’t announced viewership numbers, but these Marvel series are clearly doing well for them. Jessica Jones’ third season will be the 13th for the MCU as a whole under the Netflix banner. Let’s just hope Disney’s eventually platform of their own doesn’t end all of the comic goodness.